Assistant Professor School of Pharmaceutical Sciences Lovely Professional University, Punjab, INDIA. Extraction process plays an important role in extraction of herbal bioactive components. Ionic liquid based microwave assisted extraction (IL-MAE) has the potential to yield maximum analytes from the crude drugs in shorter time period with less solvent consumption and greater efficiency. The present study aimed to develop new protocol of Ionic Liquids based Microwave-assisted Extraction (ILs-MAE) of glycyrrhetinic acid from licorice; optimization of the protocol through RSM and comparison of IL-MAE with conventional extraction techniques like maceration and soxhlation by HPTLC. A novel ionic liquid-based microwave assisted extraction (IL-MAE) method was carried out for glycyrrhitinic acid from Glycyrrhiza glabra using ionic liquid, 1-butyl-3-methyl-imidazolium chloride ([bmim]Cl) and optimized by response surface methodology. The variable microwave-assisted extraction parameters selected were concentration of [bmim]Cl, extraction time and microwave power while solid-liquid ratio and extraction temperature were kept constant. 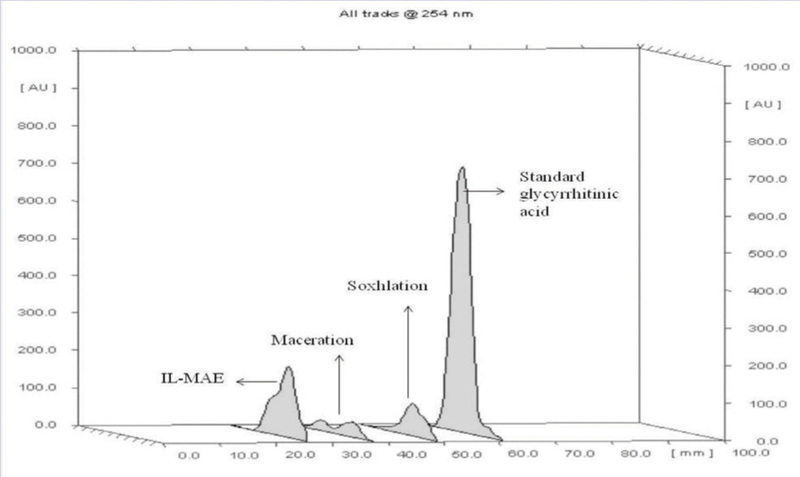 Response surface methodology was applied for developing, improving and optimizing the whole process and comparison of IL-MAE with maceration and soxhlation by HPTLC. The yield of glycyrrhitinic acid was found to be 0.48 % w/w in maceration in 7 days, 0.76 % in soxhlation in 3 h and 2.54 % w/w in IL-MAE in 4 min. IL- MAE of glycyrrhitinic acid from Glycyrrhiza glabra was proved to be better in respect of extraction efficiency, time and quantity of solvent used. Meanwhile, there was great reduction in the environmental pollution by using the green solvents/ ionic liquids (ILs), which is a great benefit to all. IL-MAE of glycyrrhitinic acid from Glycyrrhiza glabra was performed and compared with conventional extraction procedures such as soxhlation and maceration. Microwave assisted extraction parameters such as concentration of ionic liquid [bmimCl], microwave power and extraction time played a major role in extraction. The yield of glycyrrhitinic acid was found to be 0.48 % w/w in maceration in 7 days, 0.76 % in soxhlation in 3 h and 2.54 % in IL-MAE in 4 min. It clearly shows that ILMAE technique is much better than conventional methods of extraction in terms of extraction yield, extraction time and solvent consumption. All these greatly contribute to least energy consumption hence, much efficient extraction method. Where Y represents the response i.e. yield of glycyrrhitinic acid and X1, X 2, X3 are the variables concentration of [bmim]Cl, microwave power and extraction time respectively. The % yield was maximum at the high values of concentration of [bmim]Cl (X1), mid values of microwave power (X2) and extraction time (X3). It was found to be the lowest at the mid value of X1, X2 and lowest value of X3. The value of X1 was found to be critically affecting the extraction efficiency. The square terms should be retained in the mathematical model to explain the curvature of response. Value of F=3.87, shows signiﬁcant regression. Therefore, the predictive model, may be used as response surface for extraction efficiency. So, the developed methods can be used as efficient extraction protocols at industrial level. Novel approaches reported the use of ionic liquids as alternative solvents for extraction purpose with the aim in proving ionic liquids as environment friendly solvents representing them as green solvents. There is no report of extracting glycyrrhitinic acid by Glycyrrhiza glabra through ILMAE. Microwave assisted extraction experiments were performed with an UWave-1000 Microwave –Ultraviolet-Ultrasonic Synthesis Extraction Reactor (Sineo Microwave Chemistry Technology Co., Ltd, China) with a max. power of 1000 W, and it is a mono-mode with a temperature versus time and power versus time control. For the temperature monitoring there was a platinum probe inside the microwave cavity. The concentration of glycyrrhitinic acid in the extracts were detected by a Camag HPTLC system equipped with Camag Linomat 5 automatic sampler, Camag TLC Plate Heater III for drying the HPTLC plate (TLC Silica gel 60 F254 1.05554.0007 of Merck, Germany), Camag developing chamber for developing the plates, Camag TLC Visualizer for visualizing and Camag TLC Scanner 3 for scanning the developed plates. The samples were injected by Camag Linomat syringe 695.0014 Hamilton Bonaduz, Schweiz. Glycyrrhiza glabra dried stolons were collected from the local market of Rohtak and authenticated by Dr. Surinder Singh, Department of Botany of the University. Voucher specimen no. VS/Phcog/2017/182 was kept in the department for future reference. Standard marker compound of glycyrrhitinic acid was purchased from Yucca Laboratories, Mumbai. Ionic liquid, 1-butyl-3-methyl-imidazolium chloride was purchased from Sigma Aldrich. Toluene, ethyl acetate and glacial acetic acid were purchased from CDH, India (AR grade). Deionized water was used throughout the process. For HPTLC, all the solutions were strained by 0.45 μm nylon membrane. 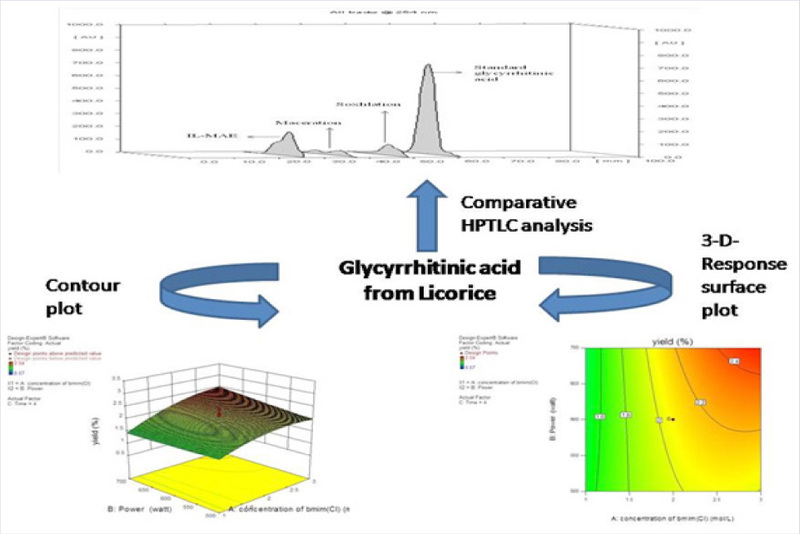 To determine the concentration of glycyrrhitinic acid in Glycyrrhiza glabra, standard glycyrrhitinic acid was used to plot the curve by HPTLC. Stock solution of 100 µg/ml concentration of glycyrrhitinic acid was used for making standard curve. Then standard glycyrrhitinic acid was mixed with methanol for making varrying concentration (200–1600 ng) was applied on pre-coated silica gel HPTLC plate and run the plate to a distance of 80 % in the solvent system (toluene: ethyl acetate: glacial acetic acid :: 12.5: 7.5: 0.5) at room temperature (25± 2º C).16 The developed plate was dried on TLC plate heater and scanned at 254 nm. Peak area vs. concentration was used for plotting calibration curve. Maceration and soxhlation were the conventional extraction methods employed. In maceration method, inside a closed vessel 10 g of coarsely powdered Glycyrrhiza glabra, was placed, added 100 mL methanol and allowed the extraction for 7 days with occasional stirring at room temperature. It was then filtered and calculated the percentage yield of extract. In soxhlation method, soxhlet apparatus was used where inside a thimble holder 20 g powdered Glycyrrhiza glabra was placed, added 500 ml of methanol in distillation flask and extracted for 3h. The extract was filtered, evaporated on a water bath to give dried extract and calculated the percentage yield. Before HPTLC analysis, all the standard solutions of glycyrrhitinic acid and extracts were filtered through 0.45 µm microporous membrane. The solvent chamber was saturated with solvent system (toluene: ethyl acetate: glacial acetic acid :12.5: 7.5: 0.5) at room temperature (25± 2º C). Sample was applied on plate and run upto 80% in the mobile phase, then allowed to dry on TLC plate heater. Then plates were scanned for the separated bands on 254 and 366 nm wavelength. At 254 nm maximum absorbance was found. Peak area was used for the quantification of glycyrrhitinic acid in extracts using standard calibration curve equation. RSM was utilized for experimental design, model building and data analysis with software Design Expert (v.8.0.7.1). Central composite design was employed with three variables and two levels to find out the response pattern and then to establish a model. All variables were taken at a central coded value zero. According to the results of single factor experiments, three independent variables with two levels for each were concentration of [bmim]Cl (X1), microwave power (X2), extraction time (X3), while the dependent variable was the yield of glycyrrhitinic acid. The range of the selective process variables with their units and notation are shown in Table 1. Randomized experiments were carried out to find out the maximum response of unexplained variability in the attained responses, due to extraneous factors. Twenty experiments were carried out according to CCD design as shown in Table 2. The number of experiments are designed according to the equation 2k + 2k + 6, where k represents the number of factors to be studied. This design comprised of a two- level full factorial design (coded±1), superimposed by centre points (coded 0) and star points (coded ±α). The axial experiments or ‘star points’ are located at a distance α from the centre, allows rotatability. Analysis of variance (ANOVA) was used for the developed model and statistical significance of the regression coefficients were tested. p- Values of less than 0.05 were considered to be statistically significant. The response surface 3 D plots and the contour plots were analysed for knowing the interactions between various independent variables and their resultant effect on the response. The ionic liquid concentration plays an important role in extracting the analyte from the drugs. For the estimation of optimum ILMAE concentration of target compounds, extraction was carried out using 1.0 g sample, different [bmim]Cl concentrations 1.0, 2.0, 3.0, 4.0, 5.0 mol/L respectively, while other extraction parameters were: extraction temperature 70 º C, extraction time 6 min, microwave power 600 W and solid-liquid ratio 1:10. Figure 1 indicated that the concentration of glycyrrhitinic acid increased with the increase of the concentration of [bmim]Cl and attain the higher yield value about 2.54 % w/w when the concentration of [bmim]Cl is higher than 3.0 mol/L, indicating that the concentration of glycyrrhitinic acid increasing slowly. 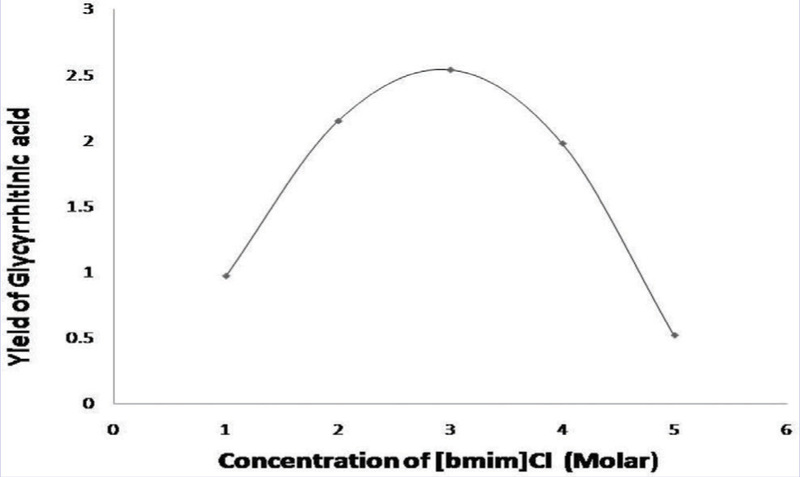 But when the concentration was increased to 4 mol/L, yield was decreased as shown in Figure 1. So, 1.0-3.0 mol/L was considered as the relevant concentration range for extraction. Effect of COME on Hot Plate reaction time in rats. 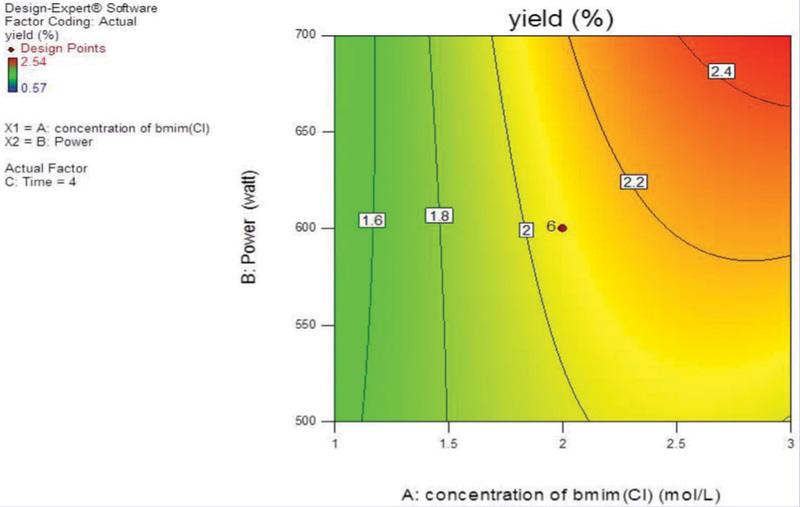 Impact of [bmim]Cl concentration on the yield of glycyrrhitinic acid. Impact of microwave power on the yield of glycyrrhitinic acid. Impact of extraction time on the yield of glycyrrhitinic acid. To know the impact of microwave power on the yield of glycyrrhitinic acid, extraction was carried out using 1.0 g sample with different microwave power of 400, 500, 600, 700, 800 W while other extraction parameters were: [bmim]Cl concentrations 2.0 mol/L, extraction temperature 70ºC, extraction time 6 min and solid-liquid ratio 1:10. 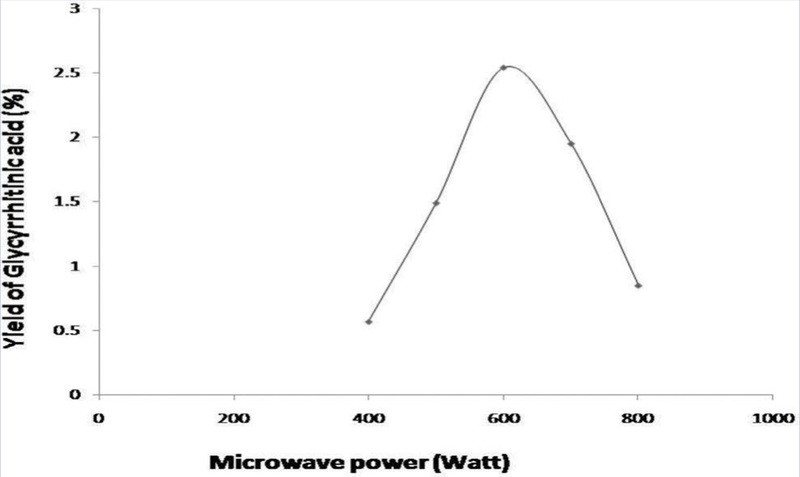 When the microwave irradiation power was 600 W, the extraction yield of glycyrrhitinic acid was higher comparable to other power and starts decreasing at above 700 W as shown in Figure 2. So, 500- 700 W was selected as the microwave power range for the experimental design. To know the optimum extraction time for glycyrrhitinic acid, the extraction was carried out using 1.0 g sample, different extraction time from 2 to 10 min, while other extraction parameters were: [bmim]Cl concentrations 2.0 mol/L extraction temperature 70ºC, microwave power 600 W and solid-liquid ratio 1:10. The effect of different time on the yield of glycyrrhitinic acid was shown in Figure 3. The yield of glycyrrhitinic acid was increased gradually from 2 to 4 min and decreased after 6 min. So, 2-6 min was selected as the extraction time for the experimental design. To know the impact of extraction temperature on the yield of glycyrrhitinic acid, extraction was carried out using 1.0 g sample, different extraction temperature of 40, 50, 60, 70, 80 and 90ºC, while other extraction parameters were: [bmim]Cl concentrations 2.0 mol/L, extraction time 6 min, microwave power 600 W and solid-liquid ratio 1:10. The max. conc. of glycyrrhitinic acid was observed when the temperature was at 70ºC, shown in Figure 4. When the extraction temperature was increased from 70ºC, the concentration of glycyrrhitinic acid was decreased sharply. So, 70ºC was selected as the optimum temperature for the experimental design. 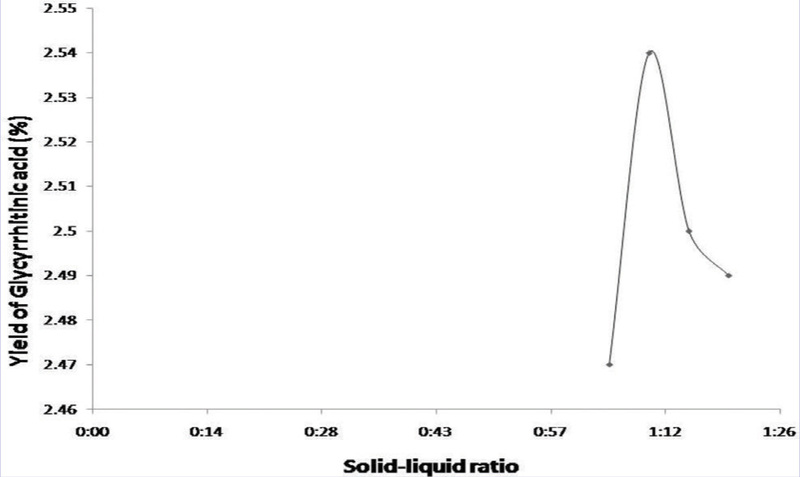 To know the impact of solid-liquid ratio on the yield of glycyrrhitinic acid, different solid-liquid ratio of 1:5, 1:10, 1:15, 1:20, (g:ml) were used, while other extraction parameters were: [bmim]Cl concentrations 2.0 mol/L, extraction time 6 min, microwave power 600 W and extraction temperature 70ºC. The yield of glycyrrhitinic acid was similar with 1:10, 1:15, 1:20, shown in Figure 5. So, 1:10 solid-liquid ratio was selected, to avoid the wastage of chemical and make the method economically efficient. 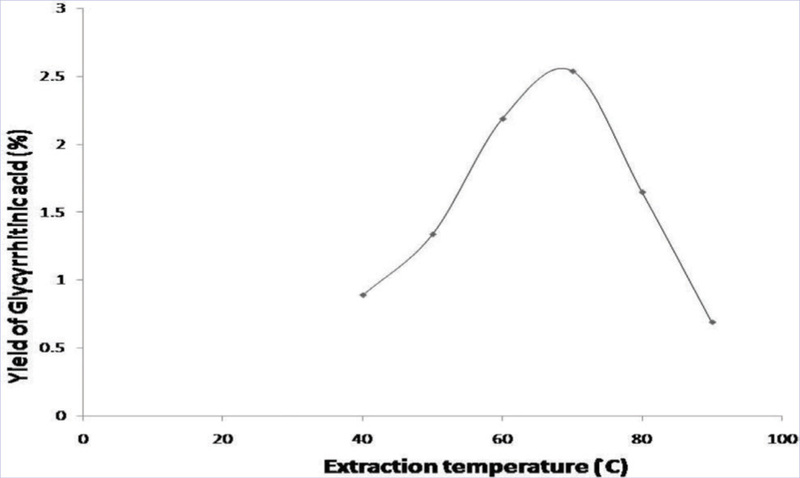 Impact of extraction temperature on the yield of glycyrrhitinic acid. Impact of solid- liquid ratio on the yield of glycyrrhitinic acid. The extraction yield of glycyrrhitinic acid from maceration and soxhlation was found to be 0.48 % w/w and 0.76 % w/w respectively. Where Y represents the response i.e. yield of glycyrrhitinic acid and X1, X2, X3 are the variables concentration of [bmim]Cl, microwave power and extraction time respectively. The % yield was maximum at the high values of concentration of [bmim]Cl (X1), mid values of microwave power (X2) and extraction time (X3). It was found to be the lowest at the mid value of X1, X2 and lowest value of X3. The value of X1 was found to be critically affecting the extraction efficiency. The square terms should be retained in the mathematical model to explain the curvature of response. Value of F=3.87, shows signiﬁcant regression. Therefore, the predictive model, may be used as response surface for extraction efficiency. Analysis of variance (ANOVA), F-test and p-value was performed for analysing the statistical significance of the response surface quadratic model as shown in Table 3. 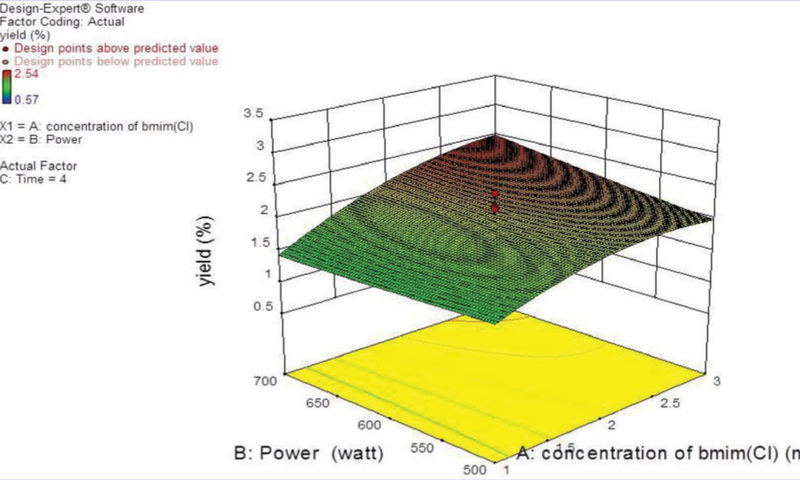 Contour plot and 3 D response surface plot were drawn to demonstrate the main and interactive effects of independent variables on the dependent variable as shown in Figures 6 and 7, respectively. To know the extraction efficiency of [bmim]Cl- microwave assisted extraction (IL-MAE), comparison was done between ILMAE, soxhlation and maceration. For comparison HPTLC was performed between standard glycyrrhitinic acid, ILMAE glycyrrhitinic acid, soxhlation glycyrrhitinic acid, maceration glycyrrhitinic acid. Figure 8 shows the comparasion through peak height and area by HPTLC chromatograms. From this peak area, yield was calculated. It was found to be 0.48 % w/w in maceration, 0.76 % in soxhlation and 2.54 % in IL-MAE, which is 2.06% higher in case of maceration and 1.78 % higher in soxhlation. It clearly shows that ILMAE technique is much better than conventional methods of extraction in terms of extraction yield, extraction time and solvent consumption. All these greatly contribute to least energy consumption hence, much efficient extraction method. HPTLC chromatograms showing comparison between standard glycyrrhitinic acid, soxhlation, maceration and [bmim]Cl (IL-MAE) extracted glycyrrhitinic acid. A new optimized extraction method for IL-MAE was developed for the extraction of Glycyrrhiza glabra using response surface methodology. [bmim]Cl-microwave assisted extraction technique was proved to be better and efficient in respect of extraction efficiency, time, as well as quantity of solvent used. So, the developed method can be used effectively as a mathematical model to estimate the extraction efficiency hence, can be used as an efficient extraction protocol at industrial level. I greatly acknowledge University Grant Commission, New Delhi for financial support and Department of Pharmaceutical Sciences, Maharshi Dayanand University, Rohtak, Haryana for providing instruments. Conflicts of interest CONFLICT OF INTERESTThere is no conflict of interest. High Performance Thin Layer Chromatography. 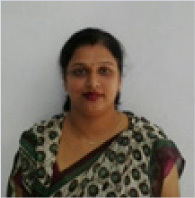 Meenu Bhan: Department of Pharmaceutical Sciences, Maharshi Dayanand University, Rohtak, Haryana, India. 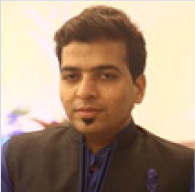 Saurabh Satija: Assistant Professor School of Pharmaceutical Sciences Lovely Professional University, Punjab,India. 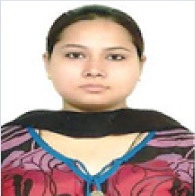 Chanchal Garg: Department of Pharmaceutical Sciences, Maharshi Dayanand University, Rohtak, Haryana, India. 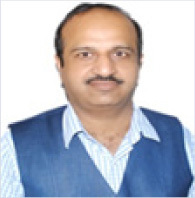 Harish Dureja: Department of Pharmaceutical Sciences, Maharshi Dayanand University, Rohtak, Haryana, India. 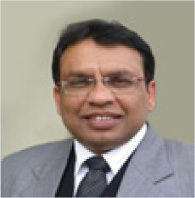 Munish Garg: Department of Pharmaceutical Sciences, Maharshi Dayanand University, Rohtak, Haryana, India.